Is it your dream to escape to somewhere more rural? Do you long to emerge yourself in nature? Most people’s desire to build a log cabin stems from the urge to be closer to nature, surrounded by an abundance of wildlife, birds and … bugs?! Much to our disdain, log cabins provide a perfect place for insects to nest in, due to their proximity to forests, plants, flowers and the earth; however there are multitudes of different ways to stop these unwanted invaders and ensure you extend the longevity of your cabin. Contrary to popular belief, these techniques are not laborious or overly time consuming. The amount of work it takes to maintain a log cabin is probably the same, if not less time consuming, than maintaining a regular house – so don’t be put off! Sapwood: the living, softer outer layers between the heartwood and the bark. The sapwood carries water and minerals to the rest of the tree. Heartwood: as the tree grows in width, the sapwood closest to the middle dies and becomes dense, hard heartwood. Nowadays, log homes are typically made from fast growing trees such as pine, fir or spruces which mostly consist of sapwood – this wood can be easily attacked by insects unless protected. Examples of more insect resistant wood include cedar, cypress and hemlock wood. Without treatment these more hardwearing woods can also be subject to infestations. Keep this in mind when selecting the logs you will use for your home, although there are many ways of treating the logs you choose to ensure they are long lasting and as resistant as possible to bugs. Preventative treatment during the construction stage is much more effective and usually less expensive than treating an infestation. Once logs have been cut, it is vital that logs are dried properly to ensure no moisture is trapped inside. It is advisable to ensure the logs you are using have been dried thoroughly. For advice on drying logs properly read this wiki-how article for firewood – but ignore about cutting to size! This treatment helps to protect the wood from pests. It is a fairly simply, non-time consuming process whereby the logs are dipped into borate solution, sometimes also being pressure treated to make sure the deepest parts of the log are protected. Logs often collect dirt and mud during the transportation and construction stage, it is therefore important to clean them in the correct way. The best way to do this is to let them dry in the sun, and use a brush to wipe away the dirt or use a recommended cleaning solution. Applying a preservative to your logs is a great way to protect them from moisture, the preservative acts as a repellent and stops the wood from absorbing water. Depending on the type of preservative you use, you will need to reapply a coat every three to five years. A good solution to preserve the cabin is Permagard. You can read more about Permagard on our article about the costs of a log cabin here. By adding a final coating to you logs you will be giving them extra protection against the sun, water, insects and general wear and tear. This chemical protects against things like insects, mould and fungi. Although it is harmless to humans and animals, the chemicals kill organisms that feed on wood hence why it is wise to use a biocide treatment. Ensuring that you care for and treat the logs prior to and during the construction of your cabin will not guarantee that you will have a bug free log home, but, it is a lot less likely that your home will be able to be penetrated by bugs if you prepare it in this manner. Most insects are in search of moist places so by eliminating moisture, you are lessening the chance of your home being infested. A good moisture content for your logs is ~20%. If you didn’t treat your log cabin properly during the construction stage and are experiencing problems with bugs, there are ways to exterminate infestations and prevent them from building their nests in your home again. Preventative treatment is typically more expensive than the process of treating wood initially – so if you have the choice treat the timber before use. Dependant on the type of insect there are different ways to treat the issue. This is one of the most common pests that are found in log homes. The adult beetles derive their name from their long antennae. As larvae, they are legless, white grubs and are sometimes known as round-headed wood borers. 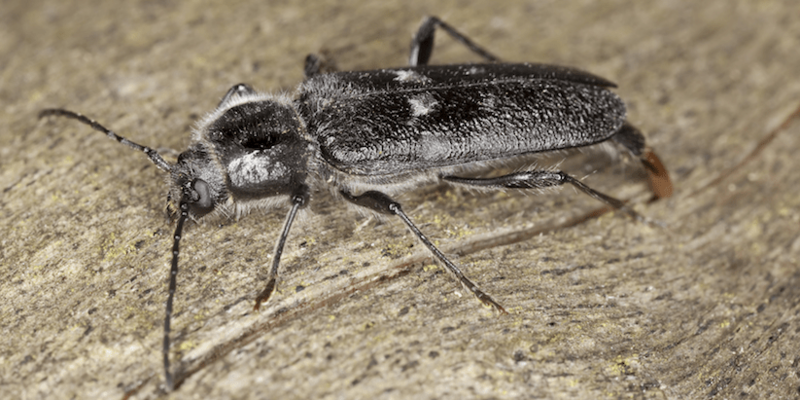 This type of beetle will usually only infest fresh wood, and so it is a matter of how quickly and how well the initial preventative treatment takes place. 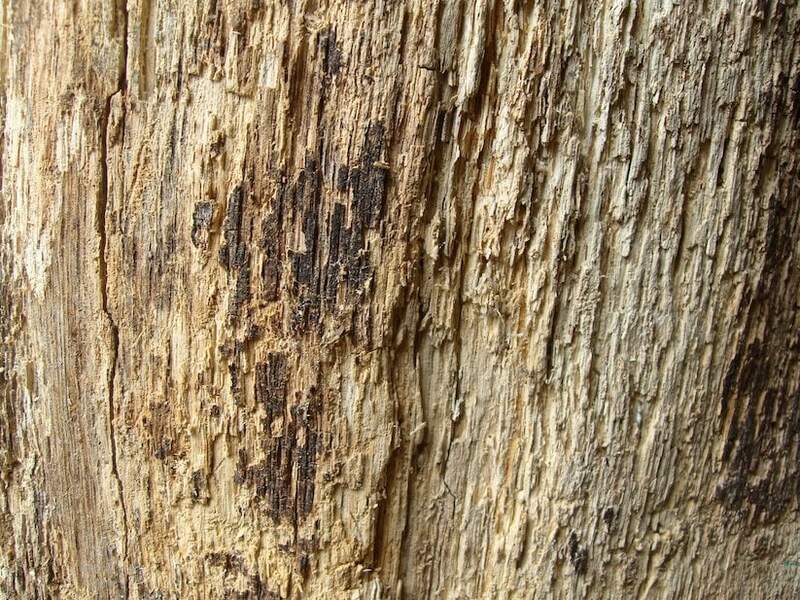 These beetles will not re-infect the same wood – this certainly is a positive for log cabin owners as it limits the amount of damage a long horned beetle can do. Tell-tale signs of long horned beetles living in your logs are large bore tunnels and circular or slightly oval emergence holes. Many professionals do not advise treatment; however many home owners want an immediate control measure. Surface treatments will not reach deep down into the wood and are ineffective; injection treatments may solve small infestations. The other option is fumigation, this provides an immediate control, although does not provide residual protection. 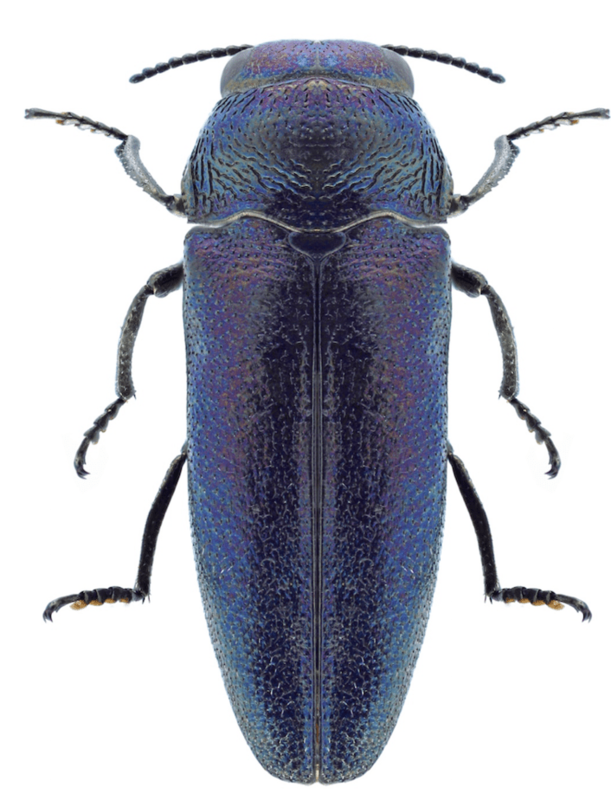 Otherwise known as metallic wood borers, they are very similar to the above beetles and will not re-infest. They leave flattened oval shaped emergence holes. Recommended treatment is the same as long horned beetles. Powder post beetles, or Anobiid beetles present more of a problem; they are capable of doing long term damage because of their tendency to re-infest wood. They like moisture and therefore getting rid of the moisture should be of top priority. They can then be treated with borates. These are large insects that can have a life cycle of ten years and more. Treatment should be similar to that of the beetles above, and can include injection treatments and fumigation. These bees are similar to bumblebees but have a solid black shiny abdomen. The female bees use their teeth to bore into soft wood and leaves perfectly round holes, about half an inch in diameter, and then tunnels through the wood with the grain. The best treatment for bees is to inject a dust formulated insecticide. The holes should then be sealed with a dowel rod or silicone sealant. Carpenter ants like to nest in buried wood or around windows and doors, although they will not cause damage quickly, they can be a nuisance. Again, as is recommended with all of these infestations, the cause of the moisture should be identified and remediated. Termites usually start their infestation at the ends of the logs so regular checks would be advisable. The recommended treatment would be to inject with an appropriate pesticide. In essence, getting rid of the bugs is not solving the root of the issue; The reason the bugs are infesting is because there is moisture in the wood. Therefore, the most effective way to ensure bug free log cabin life is to replace the rotting wood where possible, or use residual borate insecticides and to make sure you keep your cabin’s moisture content around ~20%. Ensure that you check the exterior of your cabin regularly – rotting wood is an all-time favourite for lots of insects to either use as food or to make their nest. It is useful to keep a log or diary and record when you have checked and things you notice. Crevices and cracks make the perfect home for bugs, to avoid this, use a flexible sealant to block all possible entries, including roofs, joints and individual logs. Sand, varnish or paint your logs, this way they are not as attractive to pests such as beetles. It is advisable not to use ground feed nearby your cabin to feed the local wildlife as it will encourage lots of critters. Rodents typically like underground environment and may nest under floors or decking, steer clear of keeping vegetable patches in close proximity to your cabin as this will attract rodents and the like. If you follow all our advice, I can’t guarantee you won’t spot the odd critter but it will help you to avoid a huge infestation and to help you prevent one before it’s too late. Remember, if you are reading this article before embarking upon building your log cabin, preventing unwanted bugs is much easier and quicker and usually more cost effective than trying to remediate an infestation. If you are reading this article in hope of gaining some advice as to how to eliminate an infestation then follow the above remediating tips and let us know how it goes! Have you ever experienced an infestation of unwanted bugs? What were the first signs you spotted? Did you manage to get rid of them? Share you stories with us below! Good overview. I have powder post beetles in my 30 year old cabin. I individually spray insecticide into the new boreholes, every year. Seems to keep the number of active boreholes down. What I’m looking for is a method to inject borate into these boreholes, a little deeper, than just using an aerosol can. Aerosol cans with a thin plastic tube, work ok, but it’s kind of messy with some blowout after removing the tube from the borehole, and the plastic tube tends to work itself loose from the spray dispenser. I’ve thinking maybe something more like a syringe delivery, or preferable an aerosol delivery with a stout metal tube on the nozzle. The tube has to be very small diameter, about 1/32″, or possibly tapered at the tip. Just wondering if anyone knows of such a delivery system. I haven’t come across anything as such but I will leave your comment here in hope that someone can offer assistance.